Jag har yogat i 20år och undervisat i yoga ca 10 år i mitt eget yoga center. Sedan 1994 är jag legitimerad sjuksköterska och har arbetat mest med palliativa patienter. 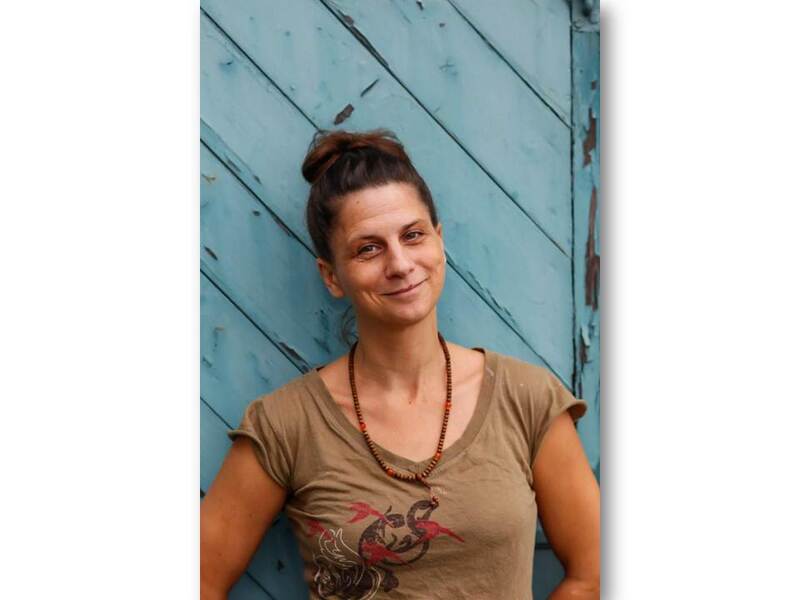 Efter 11 år i det yrket bestämde jag mig att satsa på Yoga istället och jobbar nu med det heltid, jag har ett yoga center Journeys of Yoga i Gnesta samt ger workshops o kurser i yoga. My personal journey of yoga has helped me to not be merely a proud survivor of sexual abuse in childhood and adulthood, but gave me the strength to dare to explore the dark matters of shame and guilt and transform it into light. In spite of the fact that I didn`t talk to anyone about it, there was that constant fear to be revealed as a dirty liar. The result out of the practice of self-study through yoga as my main survival tool, today I can watch, my mind, my emotions,, my memories my fantasies, my body and my sexuality with unconditional love. All of us have had some kind of trauma, so that makes our perception often deranged in some way. The” advantage” of the traumatic childhood I had is that it was so easy to understand that I needed help. Most people had semi “good” childhood and therefore can`t follow back the roots of destructive patterns to their upbringing or diminish the psychological impact of the bygones. Sometimes people don`t want to blame their parents. But it`s not about to search fail on a person but the fail at such, in order to understand our own conception or misconception of the world around. Before we can transform and go beyond our emotions we got to claim them back to being able to sort them out. Under the icon trauma and tantra I invite you to read more about healing sexuality, not only abuse victims but anyone who feels is time to go to the source of why abuse happens in the first place, the deep placed mistrust between man and woman. I like to say thanks to all those beautiful souls and deities who helped me on my path. Thomas, who had been the first to encourage me to seek help. Monika, my roommate during, and a while after, nurse-school whom I felt save with and who also reconfirmed that my childhood certainly had been traumatic. Lama Ole Nydal, who´s book, with a title I do not remember, had been my first insight in the spiritual path and the start to meditation (anyway what I than believed was meditation. To the people I was allowed to take care of in my time as nurse at the palliative care. You have truly made me understand what is important in life. That it is your friends and family you think about when you are aware that you will soon pass away. To dare to live life in joy...and, to not save the good bottle of wine for a special event - drink it today. My children Lee and Juni, who gave me back my childhood and let me understand completely that a child - not even me - ever can be responsible for childhood begones, or influence them to the better. To see you growing up to such strong and aware personalities shows me, that even though of course I very often hasn`t been the Mother I wished to, that honesty is the key. Pukka, in the time where I crashed due to post traumatic stress symptom, I realized I can´t continue as a nurse and that I really want to find a way to deepen my practice. The meaning on the paper side of the teaback stayed with me until I made up my mind , it said : to learn read, to know write and to master teach. Therese Friedh, who encouraged me to open a shala and generously letting me have part of her knowledge. She inspired me in many ways and gave me all sorts of angles to look from. Jörg Fitz, psycho-therapist and Dharma-teacher who brought me in touch with the deities, and…… the soldiers live in peace know. I learned from you that I am allowed to just be human as everybody else. You continue to come even when I had nothing to give. Your trust and belief in me made me strong. You havn`t allowed me to give up. Kjell och Tuss, all the way from Nyköping almost every week. Your discipline and determination is amazing and also it`s so much more fun when you are around. Siv, yoga and age is no problem at all and you do it with this lovely mischievous smile. Sari Nyberg yoga from inside out from the very beginning. And thanks for the classes you took over when I was sick or uncapable. Birgitta, angels does exist and you have put me under your wings. Without you my homepage would not have existed or been updated. You encourage me again and again. Well, words are not enough. Sarah Wallenskog who came up with the same idea one month later and only a couple of days before letting go of the rental contract of our yoga-space. Also your understanding of the essence of yoga surprises me again and again and you are still so young. Anna Liem who picked up on the idea straight away and pulled it off to make the non-profit yoga happen. Who protected me in that very vulnerable phase and set free the time I needed to let the unforeseen overwhelming inner change settle. Your unselfish help and support when I was sick and the motherly warmth you brought in to the shala. Hole-heartily thanks you yogis who uphold the classes in my absence. Jonny Mellberg for all practical support and everyone else that has ever been at the shala. I learned, and still do, a lot from you. So, who is the teacher ?? ?